Ideal for your little princess, the Sleeping Beauty DVD from Prima Princesses helps to teach your ballerina the basics and features fantastic footage from the Royal Ballet. 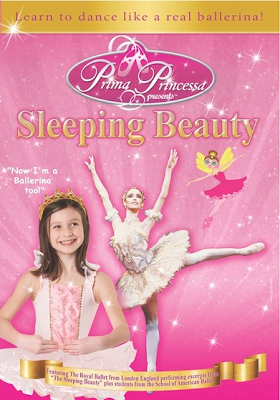 After the success of Prima Princessa Presents The Nutcracker, the next show in this children’s series, Prima Princessa Presents Sleeping Beauty, is now available to buy on DVD for £5.99 and is suitable for children aged 3-7. It contains a mixture of both live ballet and ballet step demonstrations that your children can copy at home. There is an animated ballerina-fairy that guides you through the live ballet and then encourages your child to learn new ballet steps which are demonstrated by students from the School of American Ballet. The steps include piqué arabesque, piqué attitude, demi-plié and several others between the 4 acts. It's nice to see a combination of both professional ballet with the steps to learn at home as it allows young children to be active while watching. It is easy to follow and the demonstrations are helpful for pre-schoolers. Once the ballet has finished there are bonus features to view which include a tea party and craft ideas. For your chance to win a copy of Prima Princessa Presents Sleeping Beauty you can enter via the Rafflecopter entry form below. The giveaway closes on 19th June 2013. Prima Princessa Presents Sleeping Beauty is a Parents' Choice Award winner. You can visit www.PrimaPrincessa.com for colouring pages, online educational games for children as well as information on the Prima Princessa product range. I used to dance and I encourage both my children to enjoy it (I have a boy and a girl) both my little people love joining in and my daughter is a natural! My childrens hobbies also include painting and jumping off the furniture! Would love to win this! My two little girls attend ballet classes. They love gymnastics too! My daughter loves dancing and swimming! I follow via email,networked blogs and bloglovin. my daughter does cheerleading classes - she loves it! i follow via email as talcfour and have commented on reasons to be cheerful. I follow on blog lovin & my daughters favourite hobby is dancing! Attending Bay Ballet every Tuesday with her little friends. My daughter loves dancing, she'd love this prize! My daughter just loves entertaining us. Our Grace goes to ballet every Saturday, she loves everything apart from the warm up bunny jumps. my daughter has just started ballet so would love this! My daughter's favourite pastime is making things! My daughter loves anything that involves dressing up. My little girl loves singing and dancing. My daughter loves her ballet lessons, I think her favourite parts are the outfit, dancing and music. My daughter is 5 and is just about to start ballet. I did ballet until I was 16 and have very fond memories of it; it's tough physical exercise though! My 3 year old loves arts and crafts of every kind! My step daughter loves being a princess and dancing around. Commented on the Just Dance Disney Party review. at the moment our daughters fav hobby is going to trampoline lessons. my daughter loves the tutu!